There are several options as far as capturing data from the tags that are attached to uniforms. Let’s go over the most used methods. Portals are most commonly placed at the dock door or regular entrance or exit door. These are used for bulk reading during shipping, receiving and inventory management such as capturing current stock, or adding and subtracting from inventory of a particular room or area. Portals are often set up from both sides of the door with antennas pointing toward each other; however, sometimes even one one-sided portal is sufficient, especially when using UHF. Side portals can be also replaced by overhead portals. The placement depends on the area and where there is sufficient space as well as power (and network) connections to mount the reader and antennas. 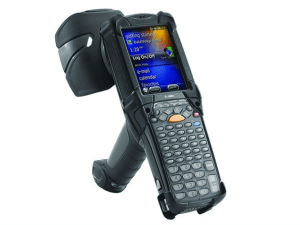 Handheld readers are most practical for their mobility, however, they require a person to operate them and scan the tags. Handhelds are more commonly used for shorter distance reading, individual item reading, inventory spot checks, shipping, receiving and labeling shipments, and other operations where human interaction is necessary. Another form of RFID reading can be done on an RFID Table. This is a table that has a reader and antenna mounted inside the table surface and tags are read as the uniforms are placed on the table. This is often used for sorting and issuing uniforms to personnel (list of items issued is compared to the list of items available to the person) as well as reading short-distance tags. Readers and antennas can be mounted in various locations. You can find them in laundry chutes to capture uniforms ready for cleaning, outside the employee lockers for uniform issuance, on the transportation bins, carts and racks, and on ceilings of storage warehouses or rooms. 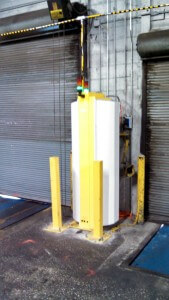 They are mounted in many points in the supply chain to provide visibility of RFID tagged items throughout. How to select the best reader for uniform tracking? As discussed earlier that will depend on the particular application. In the whole uniform management system, a combination of various types of readers and their placements is typically used. Their density will depend on the depth of visibility that needs to be achieved and the read distance. One of the main criteria for the decision will be the frequency and standard of the tags used for uniform tracking. For all UHF applications with distances of up to 30 feet or more, EPC Gen2 V2 (ISO 18000-6C) protocol is the main standard. This standard is backward compatible with Gen2 (V1) tags and will support the new tags. UHF readers complying with Gen2 V2 can be obtained from manufacturers like Impinj, Alien Technology, Motorola/Zebra, ThingMagic and others. For HF applications, there are several standards for shorter and longer distances within the HF field. The standard ISO/IEC 15693/18000-3 Vicinity Cards provide for distances up to 1.5 m (60 inches) and the standard ISO/IEC 14443 Proximity Cards provide for distances up to 20 cm (8 inches). HF readers can be obtained from manufacturers such as Tagys, HIDGlobal, Texas Instruments and Skyetek. NFC readers are based in part on ISO/IEC 14443, 18092 and FeliCa as well as standards developed by the NFC forum. NFC readers often support multiple standards, however, it is good to ensure they are compatible with the tag used in the application. NFC readers can be obtained from Skyetek, Adafruit, Texas Instruments and Identive NFC. As you can see there are many choices for uniform and laundry tracking using RFID technology. Another option is barcode technology. Even though there are a few disadvantages such as the need for line of sight and no bulk or automatic inventory, compared to RFID, barcode labels and scanners have lower cost and often are already implemented by up and down the supply chain by vendors or customers. Therefore, it makes business sense to consider it as well. We will discuss uniform and laundry tracking with barcodes in the next post. Note: RFID4U does not endorse any particular brand or standard and is not compensated for mentioning them in this post or other posts. They are simply provided as examples.